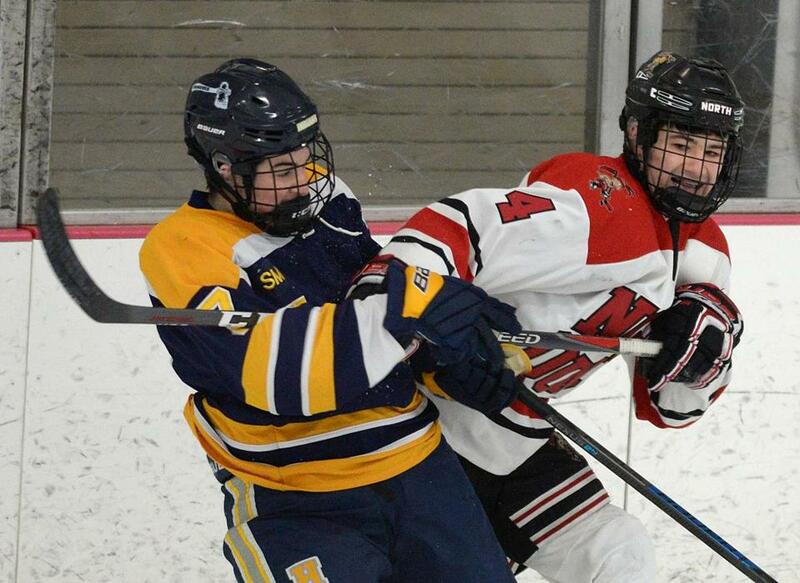 North Quincy’s Ben Wines (4) mixes it up with Hanover’s Bryan Taylor (left). Asher Wines wouldn’t mind a shot at facing the Hanover boys’ hockey team a third time this season. North Quincy’s sophomore goalie, after recording a 29-save shutout in a 3-0 win over the Indians on Wednesday night at Quincy Youth Arena, said he hopes people start to take notice of his Red Raiders, now 11-3 on the season. “If we see them again, we’re doing something right,” added North Quincy coach Matt Gibbons, alluding to the Division 3 South tournament. The win for the Red Raiders avenged an earlier 5-3 loss to the Indians on Dec. 19, a game in which North Quincy squandered three separate leads. In handing No. 12 Hanover (11-1-1) its first regular-season loss since Jan. 16, 2017, North Quincy mucked up the middle of the ice, keeping the Indians away from high-percentage scoring areas and taking advantage of their best opportunity on the offensive end. The Red Raiders managed just one goal against Hanover netminder Kevin Chandler before he was pulled for an extra attacker, a wraparound goal by Asher’s older brother, senior Noah Wines, at 5:53 of the second period. Almost as soon as Chandler vacated his crease with less than two minutes remaining in regulation, North Quincy cleared its defensive zone. Up ice, the elder Wines dished to Ronan Kelly from behind the net for an empty netter, followed by a Kieran O’Driscoll goal with Chandler out just 18 seconds later. Catholic Memorial 4, Falmouth 1 — The fifth-ranked Knights (9-2) received standout nights from senior captain Jack Curran (two goals, one assist), junior Owen Brady (one goal, one assist) and sophomore Ben Sarantopoulos (two assists). Senior goaltender Henry O’Brien earned the win in net with 16 saves. Lowell Catholic 5, Cardinal Spellman 0 — Sophomore Cody Lesko was perfect in his first varsity start for the Crusaders (5-4-2). Senior captains Alex Graves (2 goals, 1 assist) and Connor Doherty (2 goals) commanded the scoring in the Catholic Central matchup at Zapustas Arena in Randolph. Marblehead 3, Danvers 0 — Peter Santeusanio made 23 saves to earn the shutout for the Headers (9-2-1) at the O’Keefe Athletic Center. Needham 5, Walpole 2 — Freshman Joey Jourdan notched his first career goal for the Rockets (9-3). Westwood 5, Franklin 5 — The sixth-ranked Panthers (11-0-1) needed a late goal from sophomore Amanda Lewandowski to earn a point at the Canton Ice House against No. 7 Westwood. The goal sparked controversy, however, as a whistle had blown prior to the puck rolling into the net. Trailing 4-3 heading into the third period, the Wolverines (8-1-3) scored twice in 52 seconds to take the lead with time winding down. Senior Kat Keith, in her first game back since suffering an ankle sprain, scored the equalizer and senior Leah Piscatelli tapped home another on the next shift. Franklin senior Cassi Ronan netted her team’s first four goals. Walpole 4, Needham 1 — Kiera McInerney made 22 saves as the Rebels (9-2-1) used special teams to defeat Needham in a Bay State Conference battle. Walpole sophomore Emily Desimone tipped-in a second-period power-play goal. Two minutes later, freshman Jess Tosone netted a shorthanded marker to extend the lead. “Those are the type of games we want to win gearing up for the tournament,” said Walpole coach Joe Verderber. Acton-Boxborough/Bromfield 1, Concord-Carlisle 0 — Senior captain Corlene Guenard eked out the win for the Colonials (5-6), breaking a game-long stalemate by potting the winner with 1:22 left in regulation. Eighth- grader Avery Callison earned the shutout, making 24 saves at The Edge Sports Center in Bedford. Austin Prep 3, Archbishop Williams 0 — Three freshmen scored to give the top-ranked Cougars (10-0) a win over their 17th-ranked Catholic Central rival. Aylah Cioffi opened the scoring before Maeve Carey and Sam Taber secured the home victory at Breakaway Ice Center in Tewksbury. Braintree 6, Milton 0 — Junior forward Maggie Doherty scored two goals and junior captain Ellie Foley earned the shutout in net for the Wamps (10-2). Canton 4, Dedham 2 — Senior Lauren Fitzpatrick recorded her 50th career goal for Canton (6-3-4). Dennis-Yarmouth 7, Sandwich 2 — Freshman Caroline Barrett scored first to put the Knights (4-9) on top early, but the No. 9 Dolphins (10-2) rallied to pot seven unanswered goals in an Atlantic Coast League victory. Freshman Kayla McGaffigan led with six points (5 goals, 1 assist) and her twin sister Ava netted one and assisted on three. Boston Latin 1, Waltham 0 — After senior captain Kerri McLaughlin gave the No. 20 Wolfpack (9-3-2) the edge with a first-period goal, sophomore Ellen Linso stood tall in net on her way to her fifth shutout of the season in a MVC/DCL matchup. Hingham 5, Whitman-Hanson/Silver Lake 1 — Freshman Kathryn Karo registered a hat trick for the Harborwomen (7-4-2) in the Patriot League victory. Melrose 4, Peabody 3 — Senior Maggie O’Donnell potted two gals, including the winner, as the Red Raiders (8-3-1) downed the 15th-ranked Tanners (8-3-1). Methuen/Tewksbury 8, Reading 3 — Senior Julia Masotta collected a hat trick as the third-ranked Red Rangers improved to 10-1-1 with the road win. Senior captain Kat Paradis scored twice for the No. 18 Rockets (6-2-3). Nobles 4, Lawrence Academy 0 — Sophomore Katie Pyne had a three-point night (1 goal, 2 assists) and senior Courney Hyland added a goal and a helper to keep the visiting Bulldogs (11-0-3) unbeaten. Pingree 3, Newton Country Day 0 — Junior Katelyn Clarke played a role in every goal for the Highlanders, potting two and helping out on the third. O’Bryant 55, Charlestown 54 — The backcourt led the way for the Tigers as Rivaldo Soares tallied 21 points and 13 rebounds while Manny Mendes had 16 points and 5 assists in a close win for O’Bryant. The Tigers jumped to a hot start, leading 14-2, which was one of two instances when O’Bryant led by double digits. The Townies fought their way through the deficit a number of times but ultimately came up just short. Fenway 59, Cardinal Spellman 52 — With his first basket of the night, senior Melvin Cuevas netted his 1,000th career point for Fenway (9-2). Averaging 27 points per game, Cuevas finished with 24. Latin Academy 56, Boston Latin 53 — Sophomore Mason Lawson led the scoring effort with 13 points, senior Machai Thompson handled the boards with 10 rebounds, and the Dragons improved to 5-6. Bishop Connolly 59, Westport 42 — Junior guard John Rego led the Cougars (10-1) with 17 points and senior center Cooper Creek contributed 15 points and 12 rebounds. Brooks 65, Marianapolis 62 — Sophomore Matt Mulvey drained a 3 with five seconds left for the road win. Dedham 62, Ashland 61 — Sophomore Matt Ryan drilled a buzzer-beater to lift the Marauders (5-7) to the Tri-Valley League victory. Dennis-Yarmouth 59, Plymouth North 47 — The Dolphins (8-2) closed the game on a 17-4 run. Nobles 54, St. Sebastian’s 49 — Senior Jack Kaital led the Bulldogs (6-9) with 19 points. South Shore Voc-Tech 64, Norfolk Aggie 21 — Sophomore Evan Ochenduszko scored 15 points and collected 11 rebounds to lead the Vikings (7-5). Blue Hills 56, Southeastern 42 — A pair of Randolph residents, junior guard Jamillia Ross (21 points) and senior center Shanai Watson (8 points, 10 rebounds) led the Warriors (9-4). Bridgewater-Raynham 56, Durfee 35 — Freshman Shay Bollin led the top-ranked Trojans (13-0) to their 27th straight regular season victory with 14 points and 16 rebounds. Bristol Aggie 59, Upper Cape 30 — Senior Tiffany Cabral led all scorers with 28 points for the Chieftains (5-7). Hanover 49, Brockton 40 — Trailing at the end of the first quarter, the Indians (4-10) were led to victory by senior guard Janey Devlin (16 points) and sophomore forward Emily Flynn (14 points). Matignon 58, Mt. Alvernia 25 — Junior captain Emma Found netted 13 points for the Warriors (11-2). Melrose 61, Revere 31 — Sophomore Sam Dewey (26 points) powered the host Red Raiders (9-3). Notre Dame (Hingham) 49, Marshfield 38 — In a contest against her hometown school, junior Hailey Roberts tallied 15 points and nine rebounds for NDA (6-7). Scituate 56, Fontbonne 48 — Senior captains Jaycie Rojik (25 points) and Kate Montgomery (18 points) paced the Sailors (8-3). Westford 138.3, Groton-Dunstable 130.8 — Freshman Ellie Cioffi starred for the Grey Ghosts, placing first on beam with a season-high 9.4 while also finishing first on floor (9.2) and bars (8.9). Hingham 71, Silver Lake 29 — The Harbormen (5-0) clinched the Patriot League Keenan Division title. Senior Alex Hill won the 300 (37.3) to finish the year undefeated in the event while also winning the long jump (19 feet, 5 inches) and anchoring the winning 4x200 relay (1:37.3). Quincy 41, Whitman-Hanson 36 — Sophomore Joe Saccoach (132 pounds) earned a 6-4 decision in overtime for the Presidents. Globe correspondent Dan Shulman reported from Canton. To report scores, call 617-929-2860/3235 or email hssports@globe.com.